You can't beat the collection of gadgets, gizmos, and mechanical marvels found at the United States Patent and Trademark Office (USPTO.gov). 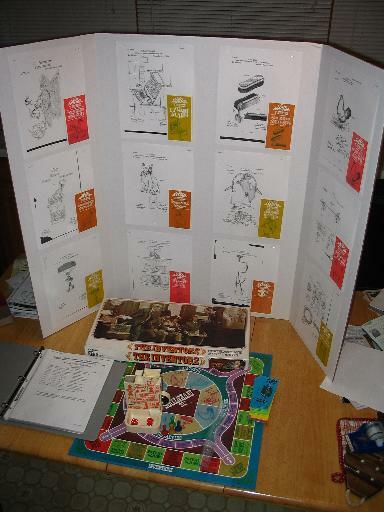 In 1974 Parker Brothers produced the game displayed here. It is based on twelve actual patents each of which could be described as a gadget, gizmo, or mechanical marvel. The game cards include the patent's issue date but not the patent numbers. Finding the patents online became a game for me. The USPTO web site only allows patent number, issue date and category searches for patents issued before 1976. I'm one of the volunteers who enters tool patents at datamp.org. 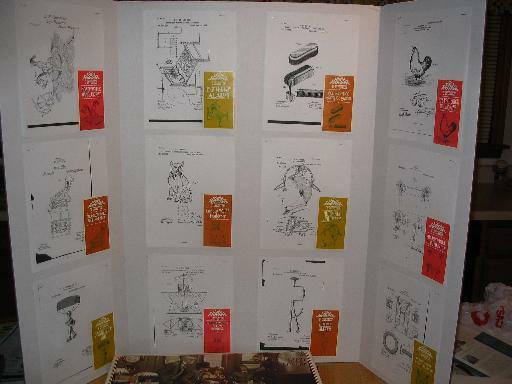 Among the patents I have entered are 11 of the games patents. One of the other volunteers had already entered the dimple making patent! A page of data for each of these patents as well as over 57,000 tool patents can be found at datamp.org. Contact me if you have patent information in electronic form that you would like to contribute to datamp. Datamp is also looking for volunteers to help enter patents. Join in on the fun of finding and categorizing gadgets, gizmo, and mechanical marvels. Here's how the search for the Adjustable Clothes Pins went¹. Step two: Issue a search in the non-modern (pre-1976) section where the only criteria allowed are patent number, classification and/or issue date. Fortunately wildcards are allowed on the advanced search page. My search was Query: "isd/11/9/1915 and ccl/24/$" Select years: "1976 to present [full-text]" (quotes not entered in the query box). In English that's a patent issued on November 9, 1915 that is in classification 24 with any sub classification (there are usually a hundred or more sub classifications per class). Fourteen patents meet this criteria. An image of each patent is displayed after clicking on the links returned from the USPTO site. The sixth one returned was the one I was looking for. ¹ I've update the search example. Recently the ability to search by issue date was added to the pre-1976 patents! Also there are now over 57,000 tool patents in datamp.